It seems No Man’s Sky developer Hello Games may have revealed their game’s next big update a bit prematurely. While no official announcement has been made yet, an unlisted trailer for No Man’s Sky: Visions is making the rounds, indicating somebody at Hello Games probably sent the link out early. The No Man’s Sky: Visions update includes a whole mess of new features, although its core focus seems to be increasing the diversity and visual splendor of the game’s worlds. Some new activities to keep players busy, like raiding crashed freighters and digging up alien fossils, are also being added. You can check out the trailer, and rundown of all the new features, below. 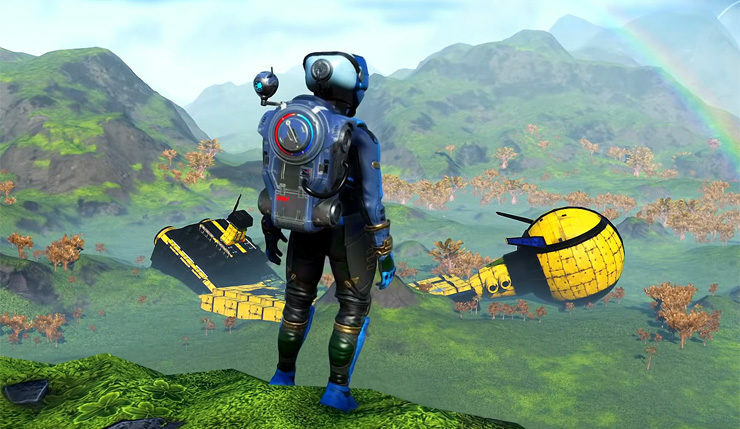 Greater Palate Variety: Exotic new worlds make exploration more exciting than ever. 5x Planetary Biomes: Planets are more varied, vibrant, and colorful. Rainbows: Visual enhancements include improved skies and atmospherics. Launchable Fireworks: Celebrate events with new constructible fireworks. Collectible Exploration Trophies: Collect rare artifacts as trophies of aliens worlds. Procedural Crash Sites: Raid from procedural crashed freighters. New Fauna: Encounter new bizarre and otherworldly new life forms. Salvageable Scrap: Debris and alien technology can now be salvaged and sold. Rare Lucrative Skeletons: Archaeologists can unearth ancient life forms. Global Community Missions: Community Missions now share progress globally. Storm-Activated Crystals: Explore extreme climates to collect precious new materials. No Man’s Sky has certainly come a long way since its rocky launch back in 2016. The game is looking downright pretty now, and some of these new Visions features should give the game even more depth. No Man’s Sky last big update, The Abyss, was released just a few weeks ago and focused on underwater missions and content. No Man’s Sky is currently available on PC, Xbox One, and PS4. Update: No Man’s Sky: Visions will be available tomorrow (November 22)!